University Distinguished Professor of Hydrogeology Chris Groves is in Guilin, China, this week where he has been appointed to a second six-year term on the Governing Board of the International Research Center on Karst (IRCK) Under the Auspices of the United Nations Educational, Scientific, and Cultural Organization (UNESCO). WKU Professor Chris Groves (front row, third from left) and other scientists joined Chinese and UNESCO officials at the opening ceremony of the IRCK Governing Board meeting in Guilin, China, on Nov. 14. IRCK is headquartered at the Institute of Karst Geology (IKG) in Guilin and is that country’s premier government laboratory for the study of karst landscapes, aquifers and water resources. Karst landscapes are those formed in soluble rock where caves, sinkholes and underground rivers are common, as so well expressed in here in south central Kentucky. There are potentially severe environmental challenges with land stability, flooding, and water supply in karst regions, and WKU scientists and students have been working with Chinese IKG and IRCK scientists to find solutions to these problems for more than 20 years. Tens of millions of rural Chinese, some from China’s poorest provinces, rely on fragile karst water resources. More than 30 WKU students, faculty and staff have traveled to China in the karst program, and numerous Chinese scientists and students have come to WKU over the same period. 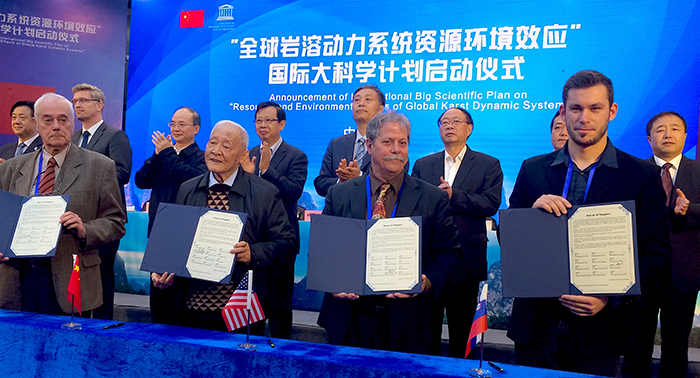 Dr. Groves has made 34 trips to China since 1995 and over that time has worked with the Chinese along with other scientists from around the world to organize water-related scientific programs under the umbrella of UNESCO, leading to the formation of IRCK in 2009. 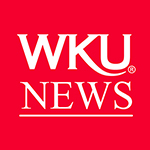 Four karst-related UNESCO conferences have been hosted at WKU bringing several hundred scientists from throughout the world to southcentral Kentucky’s world-renowned karst landscapes. 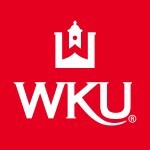 A benefit of these programs for WKU is that students have not only interacted with these scientists during such conferences and during other visits, but many have also had subsidized travel opportunities for research or to attend conferences not just in China and but other countries that have included Vietnam, Greece, France and Switzerland. During the meeting of the 2nd IRCK Governing Board on Monday (Nov. 14), Hans Thulstrup from UNESCO’s Beijing office read a letter from UNESCO Director-General Irina Bokova outlining the successes of the IRCK’s first six-year program and offering her congratulations. Implementation of extensive international efforts in research and training have included design and execution of annual karst water resource training workshops that have served hundreds of students from over 40 countries.